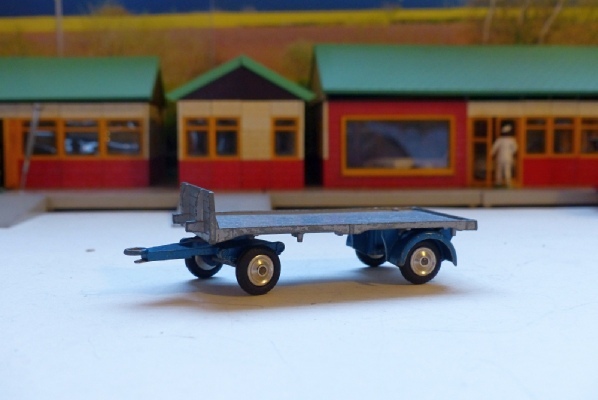 The flatbed trailer can be found in six colour schemes: the most common are silver with blue or yellow chassis. There is also metallic blue with yellow chassis. Carrying the elephant cage in Gift Set 19 is a red trailer with pale blue chassis but I don’t think this was available individually. Nor would an all primrose yellow edition which is very scarce, featuring only in the early Farming Gift Set 22. There is also the white with pale blue chassis used in Gift Set 21 with milk churns. The Chipperfields and Milk churn ones always have a fixed drawbar but the silver and blue trailers were first issued with wire drawbars, exactly the same as used on early pony trailers. Later editions came with a fixed drawbar but are quite hard to find. Here is a good silver and blue one with a fixed drawbar. It is in good condition, with few signs of wear on the flatbed, edges and the wheels and tyres are great. This has shaped fixed hubs. Acquired for my collector colleague in Germany.